In one of the first indications about manufacturer satisfaction with the Windows Phone 7 launch, an LG executive said the big Microsoft (s msft) roll-out was, “less than we expected.” The comments, provided in an interview to Pocketlint, offer not only some real insight on the way the WP7 launch has fared, but it also points to the some of the unease manufacturers and operators have with their growing dependence on Android (s goog). James Choi, marketing strategy and planning team director of LG Electronics global, said LG had high expectations for the WP7 launch, but from a consumer visibility perspective, the November introduction fell short of expectations. This comes after Microsoft said it sold 1.5 million phones to retailers, but gave no indication of end-user sales. But Choi said WP7 addresses a large audience who might find Android too complicated for them. Choi makes clear that Windows Phone 7 is still a priority for LG, because in many ways, it brings balance to LG’s portfolio. While Android (s goog) is increasingly a leader in smartphones, it’s a tricky proposition for carriers and manufacturers to be tied to one platform. Choi said WP7 is set up to be a good counterweight to Android for many mobile players including operators, who Choi says are worried there’s “too much Android,” in their portfolios. This could be the talk of an executive not interested in angering Microsoft. But there is merit to what he says. There is, I think, a good position to being an alternative to Google, which in itself shot to fame by being the best alternative to Apple’s iOS (s aapl). For manufacturers and operators, it’s nice to keep the number of platforms they support limited, but a reliance on Android could eventually leave them with fewer options for differentiation. 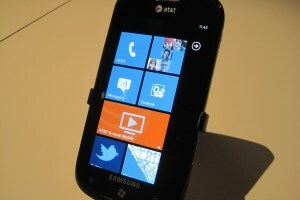 Windows Phone 7 may not be the answer in the long run. We’ll know more later but it has the opportunity to be fresh alternative to Android. The problem, Choi said, is that Windows Phone 7 is only aimed at the high-end space because of Microsoft’s hardware requirements. But he said if and when Microsoft relaxes those rules and allows more low and mid-tier phones, he expects Windows Phone 7 sales to pick up. As I’ve written before, Windows Phone 7 has a decent shot at taking away some higher end Android customers because it provides one of the most polished user experiences this side of the iPhone, something Choi seems to agree with. If WP7 can establish itself as the most credible alternative to the iPhone (s aapl), it could still catch on, because I think simplicity and cost are what many mainstream consumers want. Less than half the market has bought a smartphone, and the hold outs are going to be even more interested in ease of use. Now that the iPhone is becoming more available here in the U.S., it will be interesting to see if WP7 can still get a leg up. Microsoft has a lot of money to spend, and according to at least one parter, it still has a chance. LG makes what amounts to the “generic” Windows Phone. That is, they didn’t bring anything interesting to the table as did each of the other models. Yet all phones were sold at the same price, so it is no surprise that LG is less than satisfied. They should have been the budget option. I like WP7. I can easily imagine that LG doesn’t see it’s launch being successful because the carriers don’t seem to be pushing LG’s phones. I’ve seen the Samsung Focus as the premier phone on AT&T, and a couple of other phones that don’t seem to stand out. I think that’s the real problem for LG, their hardware doesn’t seem special, and the end user pricing is the same as the other hardware. Sorry but this phone has been a sales disaster of epic proportion considering all the hundreds of millions Microsoft spent on advertising and marketing not to mention the money spent on development. I’d much rather see manufacturers adopt another open source and free OS like Meego, than Microsoft’s proprietary OS where they set all the rules and slow down their products’ cycles. Plus, Meego would compete much better with Android on all levels and in all types of devices, not just phones. There is a lot of opportunity for growth in smart phones and there is room for Microsoft with Windows OS and HP with WebOS. On the computing side, smart phones with docking stations along with tablets will start cannibalizing the sales of Netbooks, Laptops and PCs. Also smart phones at present integrate atleast 10 different gadgets into it e.g. MP3 player, Timer, GPS, Camera etc. Thus cannibalizing the sales of these devices. In future it will integrate more such gadgets. Last but not the least, the potential to transition the users of 4 plus Billion dumb phones to smart phones. All in all there is tremendous growth in the smart phones expected in future and there is room for atleast 6 to 7 OSs each having some unique value proposition. Sounds like WP7 is like the new Symbian. For the non-techy masses. For all else – MS has probably already lost. But who had ever bet on them. Early sighting were very obvious how the platform is not going to be mature in such a short time. And in this business you don’t have catch-up time. Completely agree that MSFT will be clearly behind iOS and Android for some time. But Microsoft has proven to be quite good at playing the long-term game in the past and given that Android and iOS have such a lead, WP7 results so far look promising.